Velveeta brand cheese is the base for this extra creamy cheese sauce recipe and gives this sauce a smooth, extra velvety texture. If you love mushrooms then you'll really want to combine this recipe with our Balsamic fried mushroom recipe repeated below. 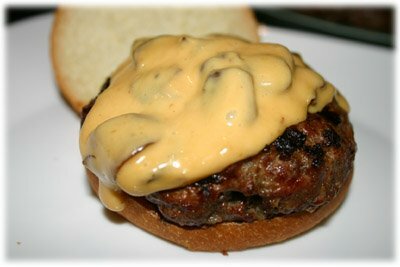 This mushroom and cheese combination is showcased on the Ultimate Burger but can be used on almost any of the other burger recipes on this website. 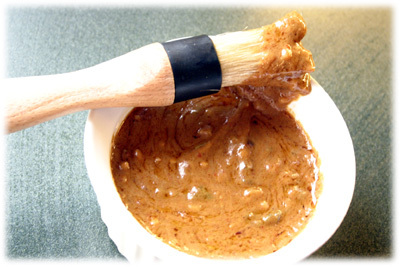 Consider this sauce on BBQ chicken, grilled vegetables or in hot cheese dip recipes. 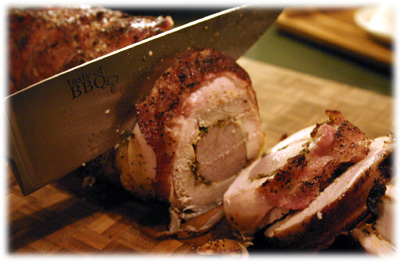 And this recipe is awesome drizzled over these Stuffed Pork Chops. Melt the butter over medium-high heat (#6 on stove dial) in a saute pan. When slightly bubbling add the sliced mushrooms. Use a large enough pan so the mushrooms aren't crowded or they end up steaming instead of sauteing. Stir the mushrooms frequently to evenly cover with the butter. When the mushrooms appear cooked and slightly golden (8 - 10 minutes) then add the balsamic vinegar and stir. Let the balsamic reduce for a couple minutes then add the Marsala cooking wine. Let this reduce until the mushrooms and sauce become thicker and stickier (and very tasty, try one). Set the cooked mushrooms aside. Pour the milk in a small saucepan and begin melting the Velveeta brand cheese over low-medium heat. Cut the cheese into cubes to help it melt faster. Watch this carefully and stir often so it's doesn't stick or burn to the pan. When the sauce is melted then add the sauteed mushrooms. Cover and keep on low heat until ready to use. Try this thick cream cheese sauce recipe on your next grilled hamburger or pork chop, it's a great finishing touch.